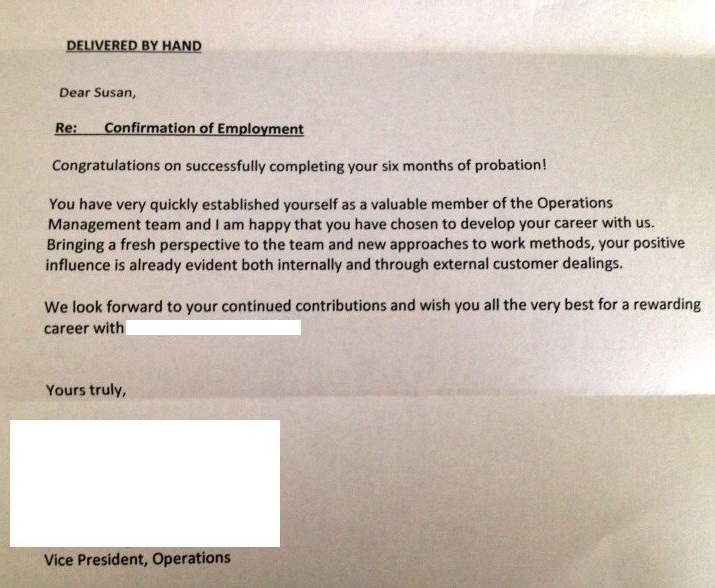 There is a weird employment provision in all companies I have ever worked for – a probation period. They usually last 3-6 months, and may be tied to the earning of conditions of employment like benefits or RRSP contribution matching etc. The weird thing about it is that the Employment Standards Act does not recognize probation as a special term in employment. Either you work there or you don’t – meaning that if you get terminated without cause you are still entitled to the severance etc that is outlined in the act. Yeah, it is going to be tiny, but nonetheless, you can’t be hired then fired within 5 1/2 months with no repercussions to the company. My current position has a 6 month probation period – which is funny because I worked for my current boss for 3 or 4 years prior to this. So she knows me and what I bring to the table. And little was tied to coming off probation, so I didn’t concern myself too much with it at all. It also helps that I knew my boss already and that I knew whatever came up would be dealt with fairly. The nice thing about probation is it forces a conversation when you come off probation about how things are going, how you’re feeling, etc. And after a while, you start thinking “Hello? Do you like me or not? Am I here or not?” So it’s nice to get it sewn up. Being unemployed, my weekends lost their value. What difference did it make if I didn’t have to work? – I never had to work. So being back to work is different – suddenly these two days take on new importance. These are the days that everything else needs to get done – and the days that you get to relax. On Friday night, I purchased yet again another piece of IKEA furniture – a bookcase. This allowed me to be able to place all the books in boxes and a number of pictures and other items in “something”. Before Emile even got out of bed on Saturday morning, it was all completed and looking great. Most of the boxes are unpacked and we have storage for everything now. Pictures are on the walls and it feels more and more like home. I made soup from some wilty broccoli and some wrinkly orange and red peppers. romaine lettuce hearts (why not?) and the non-moldy onions. (not that I was saving the moldy onions for anything) It tastes pretty good, but is a weird bright orangey green. I guess that is what happens with soup – you get what you get. With that I was able to clean out the fridge to make room for better and fresher produce in the drawer. I went grocery shopping to the biggest and busiest grocery store I have ever entered on Grandview Highway. It had ever piece of produce I could imagine – and some things I couldn’t. Since when do carts cost $1? I know I get it back, but it irritates me – is the quarter so low in value now that people won’t return the carts? I finally figured out how to make folders on the iPhone, and spent several happy minutes organizing my ap’s. And downloading some new fitness things for the hell of it. Did you know you can use “Squat Pro” ap which counts your squats while you hold it out in front of you? Do I need such a counter? Is it difficult to count to 10 or 15? But cool, I guess and I’ve done 40 more squats this weekend than any other weekend. (that also means that I cannot walk or sit down on the toilet well). Laundry was completed – though after my run which means I have to do another load. Afterall, it was cold out there and I am still getting over a cold – so yes, my sleeves are a little dirty. Yeah, eeew. January 19 & 20 Extra-Ordinary: A productive weekend makes it easier to face the week ahead. Meet with a dietician/nutritionist: Actually did that when I was unemployed because I found one that was free. Um, it was okay, but didn’t live out to expectations. Finally finding a financial adviser (who does not work on commission): I still haven’t done this yet. Anyone got a good name for me? Regularly threaded eyebrows at Gee Beauty: Well, Donna Lucia at 1/3 of the price is working very nicely for me. Gee is a bit far now. A new can opener: After 4 weeks of using my “3 chicks and a Cat” swiss army knife to open cans, I bought a new gliding can opener at London Drugs. November 3rd, 2012 Extra-Ordinary: Crossing out items on my punch list and beyond (because a facial wasn’t listed on there). I talk about weird things these days. I talk about label claims, chilsonators, mouth feel, and my favorite: Pea Protein. I didn’t know peas had protein. October 29th, 2012 Extra-ordinary: Pea. Hee Hee. Pea. Pea. 7:00 am: Five pounds lighter than previous from eating fewer Jelly Bellys and using my building’s gym. Weight loss hindered thanks to the close-by New Town Bakery and those damn Steam Buns. 7:45 am: I didn’t see a pedestrian and I started to go – if he hadn’t jumped out of the way and slapped my hood, I would have hit him. Don’t wear grey and jump out from behind flowerpot pedestrian – you may have the right of way, but I don’t want my life so negatively impacted that I need therapy for years after killing you. Seriously, guy, if you are reading this – I am still so so sorry. 8:30 am: Standing in front of a production board on the floor wearing a hairnet, bags over my shoes and a lab coat. Thinking that surely I couldn’t have finished my entire tea already and I wonder if anyone will notice my pretty shiny nails. 9:44 am: Inside voice: What are these people all talking about? 11:00 am: Quality/Production meeting where fiery Russian Quality Manager tells me how It Will Be. By the end, we agreed to have vodka shots together soon to celebrate our new bond. 12:25 pm: Eating my delightfully delicious lunch – that I had the forethought to make the night before – at my desk and trying to catch up on e-mails. Notice that I have 43 emails on the same topic – boxes. Surely something else happened today. 1:16 pm: Work cell phone rings for the first time and it turns out to be an automated message – complete with strange cadence – to remind me of an appointment. 2:15 pm: Consider reasons why I only seem to sweat from one armpit. 3:37 pm: Finally finish reading all box emails (which by now have increased in number), wondering how I am to get anything done if a box issue takes this level of communication to resolve. 4:45 pm: Dash through the spitting rain to my car to return home. Ponder the thought of how I never remember a jacket now that I live in a highrise. What is weather when you live inside? 5:15 pm: Receive email from Fiery Russian Quality Manager. Appears the bond we have is broken and Vodka shots are not in my future. 5:17 pm: Husband makes mistake of coming home and receives suitable verbal punishment. 5:50 pm: Where I belong, a life of leisure, sitting in the stylist’s chair at the Aveda Institute in Gastown. 7:15 pm: After head and neck massage, people touching my hair for an hour, I believe I may be able to do this again tomorrow. 7:50 pm: Exchange emails with Production Manager to confirm that my worries that I have lost my mind are unjustified. October 22nd, 2012 Extra-Ordinary: Visit to Bizarro land.